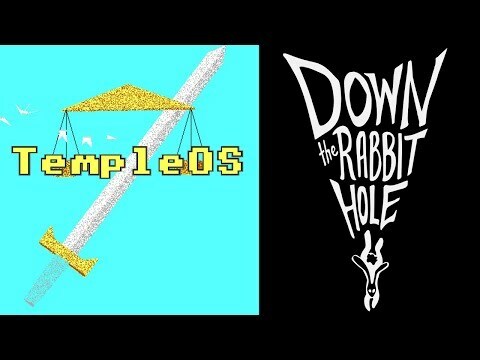 Maybe you would like to try #TempleOS, a very innovative operating system that was explicitly designed as a playful learning platform from a recently passed #hacker named #TerryADavis. It's deeply inspired by #Commodore64 (in particular the UI), and it's completely written from scratch in #HolyC, a #C like language that is... somewhat unique. It's a pretty decently done documentary. I've heard bits and pieces of this tale over the years, but this video does a great job of putting it all together, and giving the viewer some perspective on the chain of events. After watching this I now feel sympathy and empathy for Terry Davis. I once just wrote him off as 'nuts' (in the vein of something resembling a white-nationalist-nazi), and certainly his ideas were crazy... the ideas - not Terry, though. Terry Davis was mentally ill, and you can see the steady degeneration clearly in this video. Despite the ignorant ideas he would post, he was a person who wanted what many of us want; he desired to be accepted and appreciated for something for the things he dedicated himself to. Clearly the rejection hastened the decline in his condition. There's a lesson to be learn here in regards to how we treat people online. The sum-total effect of so much rejection and negativity is hard on anyone. Sure, he dealt most of the negativity, but it's a 'one to many' vs. and 'many to one' issue. Even if someone posts terrible things, it usually isn't directed at one person - it's sprayed at many. When this happens the 'many' who were hurt by this one person can arguably cause greater damage as they are focusing the words of so many on to one person. In these situations maybe we drive those who would otherwise just troll around the internet to do terrible things (Terry did claim to have ran someone over and killed them many times, but it seems unlikely to be true). Of course, I'm thinking of what happened in New Zealand recently, too! I just worry that all the back and forth between so many sides of humanity, left and right and myriad others... when entire groups can focus their negativity on individuals (whether it's justified or not is irrelevant to my point), what are we pushing those individuals to do? There are better ways to handle ourselves when confronted with ideas we consider toxic and offensive. Productive things, like asking questions that might help someone see the end result of their short-sighted ideas, educating or even debating them, but with greater care to prevent it from degrading to argument. We all know this, but anger is much like a sort of 'temporary mental illness' and it makes us say and do things without fully rationalizing the consequences. We need to consider that the people we talk to online could be suffering from a mental illness and might not know how to deal with what is coming at them. Few of us are equipped to deal with what feels like rejection for a large portion of the society, as it's a fairly new occurrence that the internet facilitates. I certainly don't mean to justify people who do heinous acts! Nor do I wish to redirect blame on to victims. Not at all! You've misunderstood me, or rather I've failed to convey my thoughts, if that is what this sounds like. For example, I consider neo-nazi types to be scum, that's just my personal opinion, because their ideas incite violence and they spread hate - but my point is that maybe we all incite violence when we allow ourselves to focus our anger, as a group, on to one individual. My opinion of neo-nazi types is 'one-to-many' (my opinion of a group), the sort of ideas we're all entitled to have and certain to have people disagree with us. But when an entire group focuses animosity or hate on just one individual, a 'many-to-one' relationship, then it is easily overwhelming for that person. Regardless of whether that one person is a decent human or not, it's a lot of weight to bear, and can easily cause a person to snap if they are already suffering from mental illness. And since we can't really know if a person is suffering, or not, it's probably best for us all to not push people this far. It only makes both sides more likely to exhibit more violence. Well, unless you just plain disagree with me, I think I've sufficiently conveyed my point here, haha. All I'm saying is... let's handle each other with care. Please.